Demeter 1.5 – Free – PowerPC 10.4/10.5 – Tiger/Leopard – This Browser is based on Shiira – http://www.macupdate.com/app/mac/25489/demeter (Stable version 1.0.9). On http://mac.softpedia.com says that is Jaguar supported…if there are any Jaguar users reading this, can you help us remove the doubt?? Thanks. iCab 5.0.1 – Shareware – PowerPC 10.5/Leopard – http://www.icab.de/index.html – iCab is an alternative web browser for the Apple Macintosh with numerous useful features. On the web site it says it is Intel but it does work on PowerPC. iCab was very good playing Youtube’s video. Next post is about Roccat. MacLampsX 2.0 (Free) PowerPC 10.4/10.5 (Tiger/Leopard). Let’s have some fun playing with our Desktop a bit! MacLampsX brings light to your Desktop and allows you to decorate for Christmas or any other holiday! It has a small set of default holidays but also allows you to create your own. This version allows you to add bigger bulbs and to play music. Now every holiday can be happier than the next, and allow you to properly celebrate…on your PowerPC. That is a cool app that will work well for anyone with a well organized iTunes library! Get this….it fetches the lyrics to the songs you are listening to, direct from the internet, as you listen! I love this app…So far everything is working out great! TuneLyrics is a perfect app that fetches lyrics on the fly, so now when you were enjoying your favorite music you can review the lyrics to see if you are singing the right words! If you are looking for a nice menu bar shortcut for your applications or utilities, I think your search is about to end! Let me introduce to you HimmelBar. *HimmelBar 3.0 (accepting donations) http://softbend.free.fr/himmelbar/download.html – 10.4 / 10.5 – PowerPC friendly. It’s a very small icon on menu bar that gives you many options to easily access your folders, applications, etc. You can also customize the folders and applications to better suit your needs. After you start using it, you will likely question yourself why Apple didn’t think about this before because it’s a great feature and makes browsing your own computer much easier! One of the features that I like is that you have the choice on what size your icons are displayed (big, small or not at all!) Make sure you check the options Launch at login and go to Preferences as soon as you install, to do the setup the way you prefer. Browsing the web this morning, I came across a great application that it gives extra features to iTunes. MultiTunes is a plug-in that allows you to have multiples iTunes libraries. If you are an iTunes user, you know what I mean and you probably wonder how to have 2 iTunes installed in the same computer… Anyways if you feel like trying this app it’s shareware and works with iTunes 6 or later. *Libra 2.1.9 (ShareWare – 10.00) 10.2 (Jaguar), 10.3 (Panther), 10.4 (Tiger) and 10.5 (Leopard) PowerPC – http://www.sillybit.com/libra/ It’s very rare to see apps available for Jaguar. Anyone that has partitions with Jaguar and Panther sitting on the side, it’s time to boot the feline one more time. We from Mac PowerPC are always looking for the cheapest ways to do things and we want to let you know that there is one way to have multiple iTunes libraries in the same computer, but it won’t be as practical as Mac users like things to be. The only thing you have to do is “hold Option key” and click on iTunes icon, a window will pop up asking if you want to create a new Library or choose one, that’s it! It’s simple but you will have to get used to pressing the Option key each time you want to change your iTunes library. Installing Leopard on unsupported PowerPC Macs (like less than 867MHz requirements). In the last post I mentioned our difficulty in finding a way to partition an iMac. The message ”Partition failed with the error: File system resize support required, such as HFS+ with journaling enable” kept displaying on my screen. The only solution was to format the iMac and start from scratch. Unfortunately, my DVD requirements weren’t quite right for our machine but after a few hours browsing different sites, I finally found this amazing application/plugin called LEOPARD ASSIST. And what this app does is essentially virtualizes a 933MHz processor in such a way that your system will think you have all the requirements necessary to finish the task of formatting your less than 867MHz machine! I was very excited to see the results and everything seemed to be working perfectly and finally I was having no more errors. So, once again I clicked on Spotlight “the brilliant lazy way to find anything on your Mac” and Disk Utility get ready because tonight you will work!!! 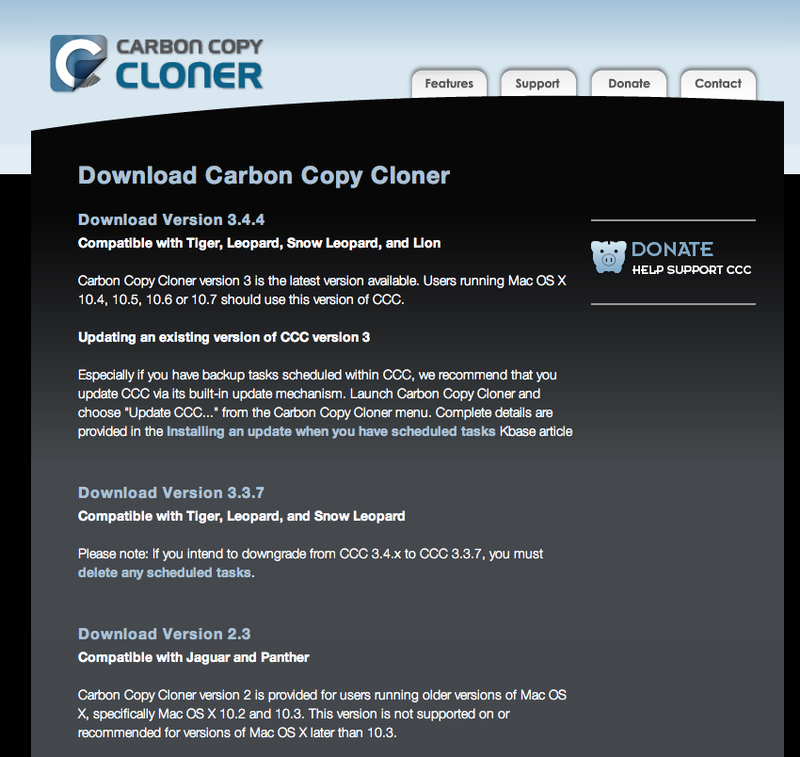 OMG – Everything worked out…I created a partition and installed Tiger beautifully! Once it was ready, the only thing I had to do is launch System Preferences > Startup Disk and target which disk I preferred to start when I turned on the Mac. 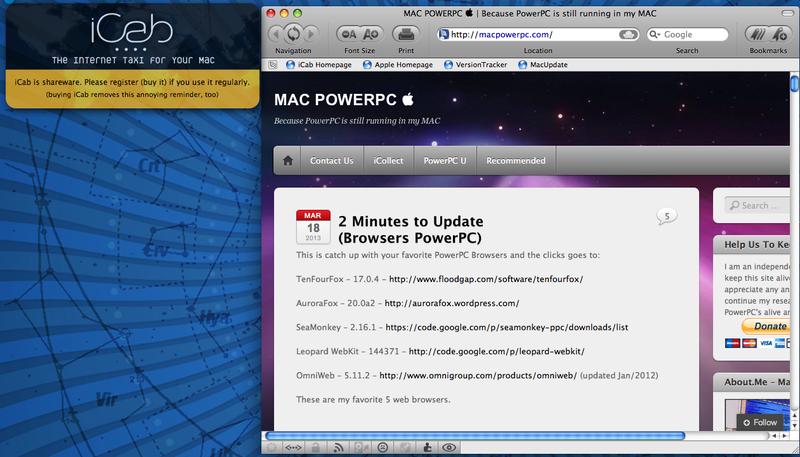 It’s really hard to say which browser is the best option for PowerPC these days, it’s a never ending forum. Today we can not complain about it anymore because we have some great options. I believe TenFourFox (http://tenfourfox.blogspot.com/) is installed in 11 of 10 PowerPC Macs around the world and it’s probably one of the most powerful and updated options today and runs in G5/G4/G3. Also Aurora, that just came out for PowerPC, seems to be the promised one. I’ve been using it for the last few weeks and I always have 4 tabs + google and it didn’t crash once! So far it seems to be a very stable browser. We can not forget to mention Camino, which is another good option and before this list starts growing (thumbs up) let’s mention some names that are not quite as popular but they deserve to own a place in your hard drive. NagaraBrowser (1.0.1) (PowerPC 10.2 [way to go Jaguar] or later) – http://www6.plala.or.jp/lingo/contents/software/nagarabrowser.html The nicest thing about NagaraBrowser is the full screen view mode. You also have your entire desktop to work as a browser and you still have all access to your docks. Also, you can open any search web site like GOOGLE for example and leave it as a wallpaper in case you need to do some fast research, you just press the short cut (command + tab) and bingo, it is ready for you! Having all your research as wallpaper makes your life really easy when you are reading and writing at the same time! Stainless (0.8) (PowerPC 10.5) – http://www.stainlessapp.com/ I like to use Stainless because it’s very fast, very stable and it has a very nice layout. It kind of looks like Firefox but the Bookmarks are in the left side (vertical). I’m not quite sure how long they will keep updating this software for PowerPC compliance, but let’s hope that our community gets bigger and bigger not only for those that already have a PowerPC Mac but also for those that own an Intel and want to have a second machine running side by side. I also enjoyed parallel sessions which allow you to log in using different credentials in separate tabs at the same time, that’s awesome new feature, not even Google Chrome has something similar. This app also helps you to do a back up on a regular basis, so make sure you clone your hard drive and then start using the back up by just choosing the target external hard drive! I would like to say thank you for all the e-mail that I received and for the nice words. It’s nice to know that we are still out there, even after Christmas time, because I noticed that the number of visits dropped lower than usual. I think a few PowerPC users got Intel and they decided to join the dark side. Thank you guys! Please subscribe or like my blog. I appreciate any donations to keep my research alive! This blog is for us!